Itineraries are crucial to have prior to leaving for a trip. It is the map that helps one plan the most logical route to move from place to place, and is great when you still need to figure out what additional accommodations you may need; hotel room, rental car, transportation, etc. It is also useful to have an itinerary to aid in mapping out activities or landmarks in a certain area you want to visit. Day 1: Travel Day - If you are flying from the United States, you will most likely have to route through a city in Europe. We found it easiest [and cheapest] to fly through Madrid before continuing on to Marrakesh. Day 2 - Day 5: Marrakech. Since our travel day extended into the morning of Day 2, due to time zones, we spent the afternoon of the second day till the morning of the 5th Day exploring everything Marrakesh has to offer. We choose to stay in the Medina, the old city section of Marrakesh, so that we were close to historical attractions and authentic areas of the city. Day 3: Essaouira Day Trip: We decided to take a day trip by bus out to the costal city of Essaouira. This pleasant town was laidback with beaches and great seafood. While the bus experience was... strange.. it was worth the trip! Day 5: Pickup rental car and drive to Merzouga via Ouarzazate. This was a long haul, and was 'supposed' to be approximately an 8 hours; however we learned quickly that driving in Morocco isn't as easy as driving in the United States. (check out our guide to driving here) We ended up on the Atlas Mountains and had to spend the night in Ouarzazate. Day 6: Ourzazate to Merzouga. We spent the morning part of Day 6 driving to Merzouga to get to the Sahara Desert for our camel trek and overnight stay in the Sahara. Day 7: Overnight in the Sahara then drove to Fez. After an amazing and breathtaking experience in the Sahara Desert, we hit the road again for a 7 hour drive to Fez. This time we made sure to drive on the correct roads and not go over the Atlas Mountain range. With a late arrival into Fez we spent most of Day 7 driving. Day 8 - Day 11: Fez: We chose again to stay in the Medina in Fez. Navigating the narrow tunneled streets of the Medina we found, we spent three full days exploring the city and all it had to offer. This city is much quieter than the Marakkesh Medina. Day 12: Depart Fez for Chefchaoen, stopping in Volubilis and Meknes: We decide that we wanted to swing through the wine region of the country and took a wine tour in one of three vineyards in the country. We then quickly drove over to Volubilis to see the Roman Ruins. We arrived late in the evening in Chefchaoen. Day 13 : Full day Chefchaoen: While we experienced rain showers on and off during our entire time in Chefchaoen, we still explored the beautiful blue city. Day 14 : Part day in Chefchaoen then depart for Casablanca; with a detour to Rabat: After spending half the morning exploring Chefchaoen, we decided to hit the road for the four hour drive to Casablanca. We decided to stop in Rabat, just over 2 hours into our drive to visit a friend of Sheilas from college. 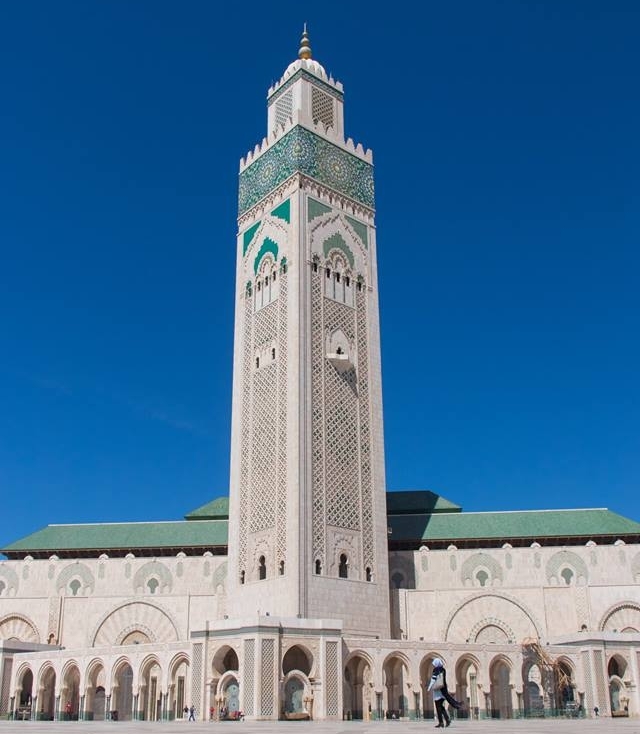 We explored the capital, ate some delicious food, then finished our journey to Casablanca. Day 15: Half Day in Casablanca then overnight in Paris: Casablanca is a very modern city and only needs a half day to see the major sites. We spent the morning and early afternoon visiting the famous Hassan II Mosque. Day 16: Morning in Paris and Flight back to the United States. We stayed up all night and explored the 'City of Love' before heading to the airport for our flight back to the United States.